No matter where I go to get my coffee, the same problem surfaces. I usually only throw $5 down the drain at a Starbucks if I need to wake up, or because of the temperature outside. If it's like 130 degrees outdoors, I usually think, "Something cold to drink would be nice." So I park my sweatbox car and go inside. Then. BAM. 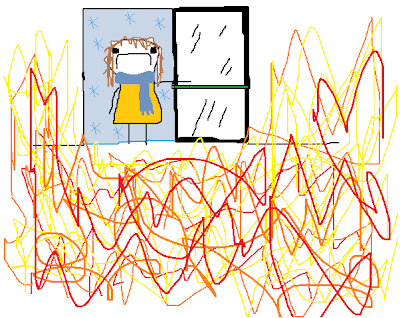 It's snowing inside and I'm wearing shorts. It feels nice for a moment. But then I get uncomfortable. I go up to the counter to order my drink like someone who has never been inside a Starbucks before. 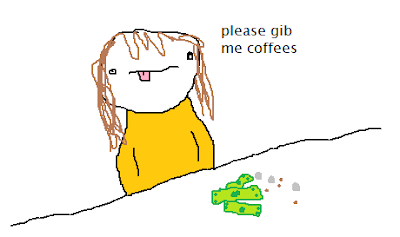 Me: "Can I have a medium-size cold coffee thing with lots of caramel in it?" Barista: "An iced mocha frappuccino..? With caramel?" 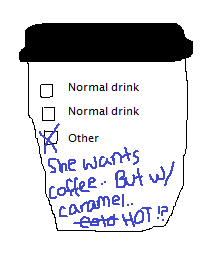 She proceeds to write a long, explanatory novel on my cup so the coffee savvy employees can understand me. Me: "Actually, do you have an equivalent to that drink in a hot version?" Of course I get a strange look from the girl, who is sweating from a hard day's work. Barista: "You could get a cafe mocha with caramel. Would you like caramel sauce, or caramel syryp?" Me: "...Uh, I don't know, whichever makes more caramel in my drink." Barista: "They are probably the same." So I wait, doing a dance to keep warm that makes me look like a 2nd grader praying to pass a bathroom on a field trip to the zoo. And then I curl up in a warm comfy chair and drink the thing. It is dental health suicide. And it's wonderful. After that delicious drink, I'm warm and toasty and comfy all over. Soon I remember where it was I was headed, and leave. 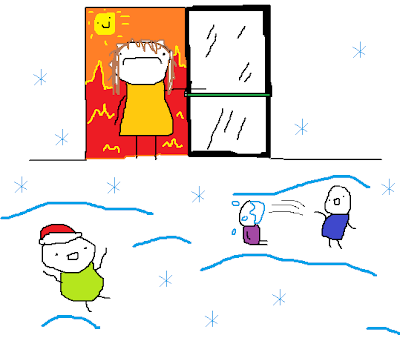 I open the door. 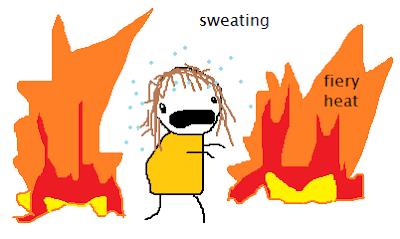 It's still 130 degrees outside. The dangers of too much AC I guess :P Nice illustrations btw! Haha thanks.. that's as good as they get using a mouse in paint.